Everyone ready for take two of Motorola’s Cyber Monday extravaganza bonanza? 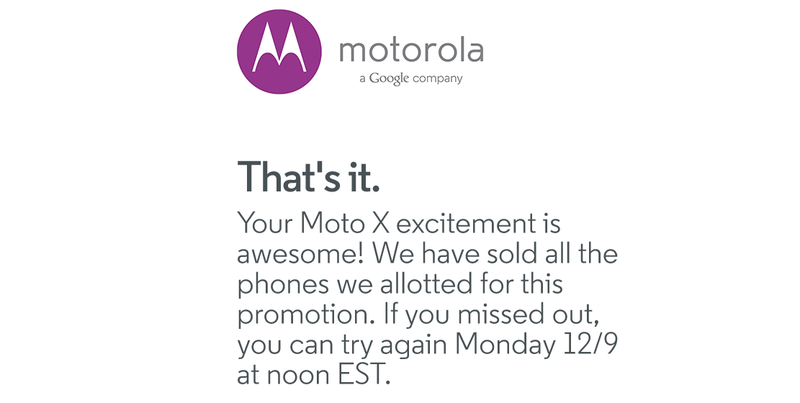 After a rocky go-of-things on Monday, Motorola is kickstarting their $150-off Moto X promo this morning at 9AM Pacific (12PM Eastern). Things are a bit different this time around though, as you can’t purchase a custom made MotoMaker Moto X until Motorola has given you a code. The new deal works like this – in order to get a code, Moto has setup a landing page for registration. Once you have registered, you wait for a special code to arrive. 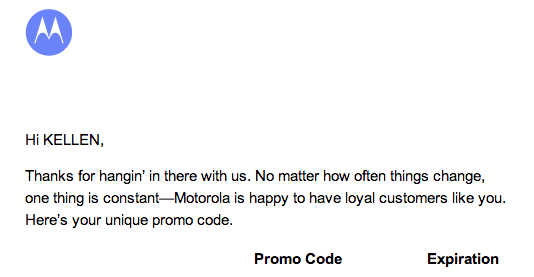 With code in hand, you have 1 week to use it during checkout on a Moto X through MotoMaker.com before it expires. The code will knock off $150 from the full retail price of the phone. By going with a code system, Motorola is hoping to alleviate some of the pressure that their site sustained on Monday when the entire tech world flooded in to try and by a Moto X at the steeply discounted $349 price. Developer Editions are excluded this time around since you were actually able to buy them on Monday. The rest of the details can be found here (and here). As of me clicking “publish” on this post, it looks like we are 20 minutes away from kick off. UPDATE: ALL GONE. The next wave opens up next Monday, December 9. 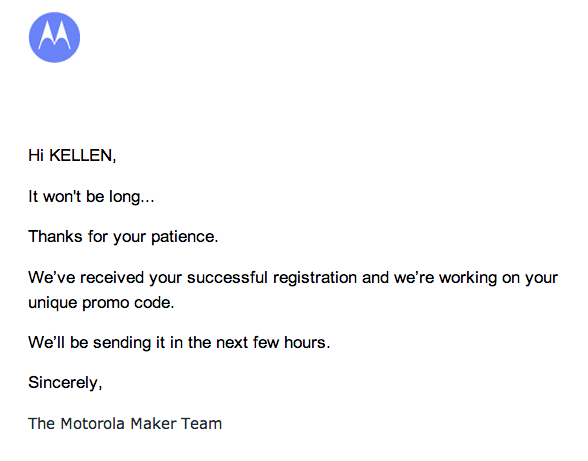 UPDATE 2: Motorola just sent out email confirmation of registration to confirm that you will soon be able to buy a discounted Moto X. This email does not include your promo code, but it promises that they are still coming. UPDATE 3: Promo codes are being delivered!